Pictured in a puppy cut, Kahlua is showing off her great body! Kahlua is dam to CH. Blanch-O's Sugar Daddy, CH. Braz When Lightning Strikes, CH. Braz Mikah, and CH. Braz Blazing Barrels of Carohav. 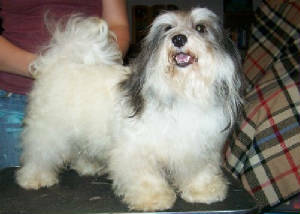 She is the daughter of Chip, top producing Sire in 2003 and granddaughter to Hotshot, #1 Havanese in 1998 and 1999, and first Havanese to win Best in Show.